Coming off yesterday's positive report on the real estate market, I have some more information to share from our daily metrics that we track on Tallahassee housing. There are three bits of good news (the Yays!) and only 1 piece of not so good news (1 Boo!). 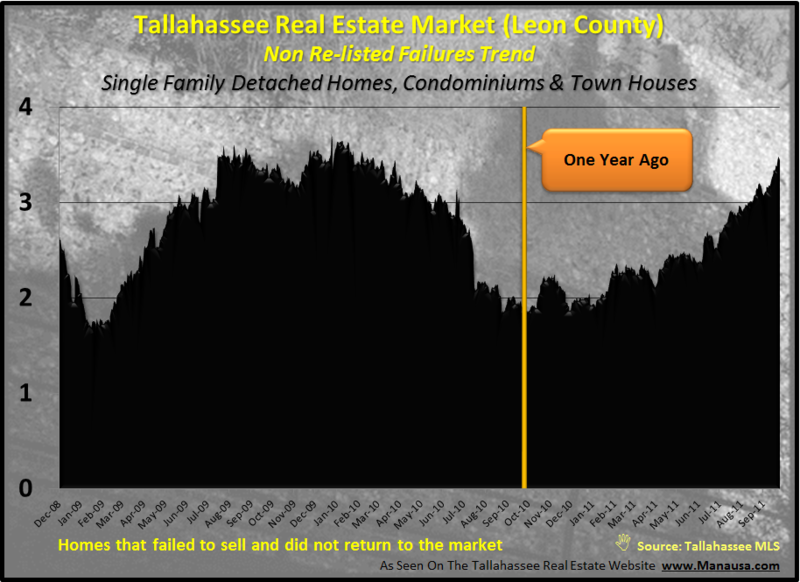 Pending home sales, closed home sales, and the home sales success rate are all rising in the Tallahassee housing market, while the "failed to sell" homes are growing in the shadow inventory. 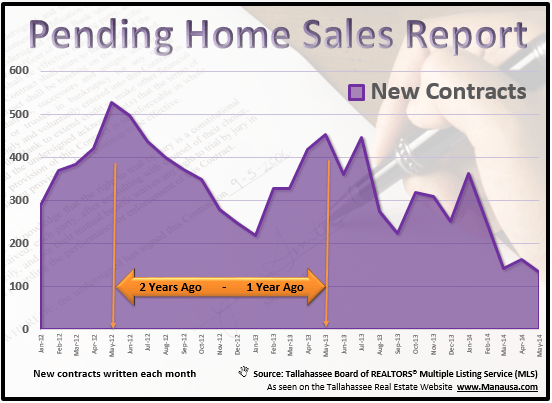 First of all, the pending home sales graph (seen below) shows that the Tallahassee housing market has had the same number of daily new contracts now as we did a year ago, but the difference is quite wonderful. At this time last year (see gold line in graph), the trend was declining, whereas the current trend is on the rise! 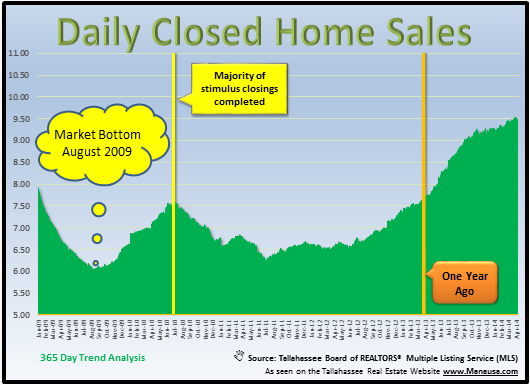 Closed home sales in the Tallahassee housing market are on an up-trend, meaning more homes are closing every day than they were a year ago. We need to see demand return to the market, and hopefully this is a sign of the beginning of a long-term trend. Last year, closed home sales in the Tallahassee MLS were higher than they are today, but back then the trend was falling. Our current rising trend has been ongoing for the past 3 months. 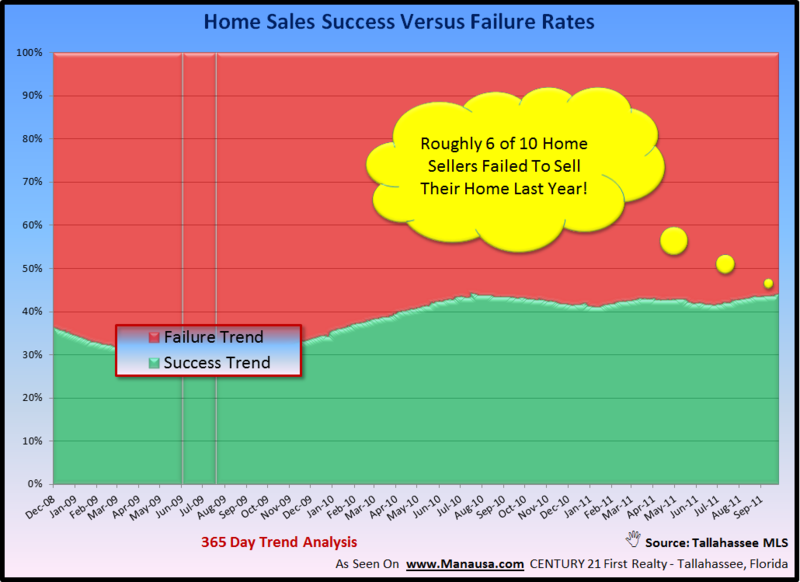 Another positive trend in the Tallahassee housing market can be found in the home sales success graph below. The success rate for home sellers is approaching a 3 year high with 43% of homes entering the market are selling. This number might not sound so good if you have to sell a home right now in Tallahassee, but it is far better than the 30% rate that we saw in recent years. The only bad news to report today is the growing trend of "recently failed to sell" homes joining the shadow inventory. We normally like to see this stay below two homes per day and simultaneously see the glut of inventory being reduced. Currently, the reduction in the number of homes for sale is offset by homes not re-entering the market, so our real inventory levels are not falling. Overall, this is one of the better Tallahassee housing reports that we have seen in the past four years. There are positive trends that appear to be taking shape and hopefully this will continue and we will see demand levels move towards our historical norms. Currently, the Tallahassee housing market is only trading at about half its normal level, so focus on the restoration of the demand side is what we need the most.